My interest in flat-pattern drafting and cutting started to develop when I realized that I would never find a jacket that perfectly fits me. Dear readers, if you are not filthy rich to make your jackets by a tailor nor a supermodel with perfect measurements, this rule also applies to you. The method I present here allows you to draw a perfectly fitted pattern. You can see two main advantages to this: the first is that you can transform this basic shell into an infinite number of patterns for blouses, shirts, jackets and coats; you are the stylist now. The second is that you do not have to adjust a commercial pattern anymore because it is already cut for your body. The disadvantage is that, at first glance it can seem a bit technical, but do not worry because this feeling will disappear once you have read the steps below. All you need is a clear ruler, a protractor, a curved ruler and to know how to draw a perpendicular and parallel, to measure an angle and do some simple maths. So, normally, if you are older than 12, you can make it. 1. 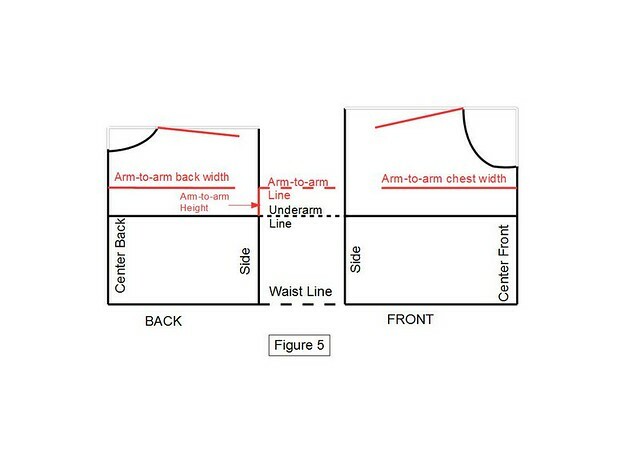 First take out your measurements as shown in Figure 1. It is better if someone else takes your back measurements. At this point, you should already have noticed that the front neck-to-waist is longer than the back neck-to-waist (because you have breasts my ladies) and the arm-to-arm chest width is narrower than the arm-to-arm back width (shoulder blades and various bumps). This pattern is designed to closely fit your body so it does not include the “ease” or the additional loosening that allows you to move in your clothes. 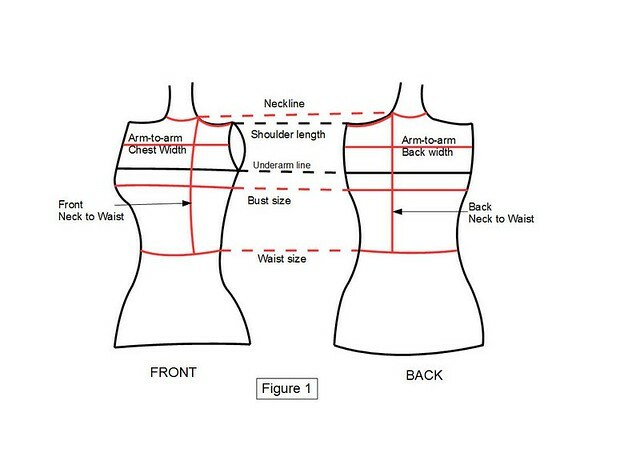 The ease will be added to all your garment patterns using the basic pattern. Then draw the vertical lines corresponding to the back and front neck-to-waist length and close them with the shoulder line. 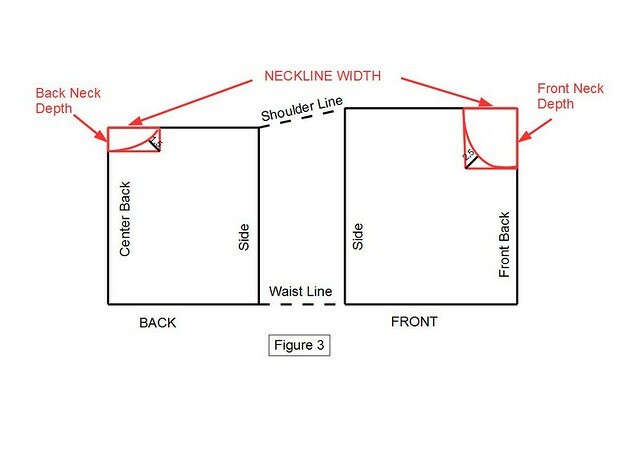 Mark 1.5 cm for the back and 2.5 cm for the front on the bisecting line (line that intersects the angle into two) between the neckline width and neckline depth. 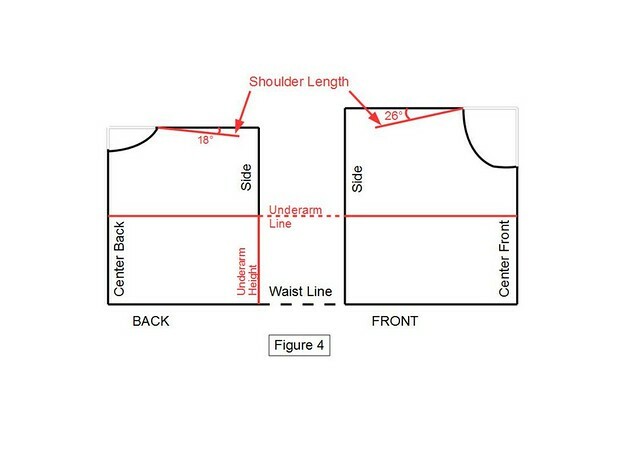 Draw the neckline with the curved ruler and try to have a flatness of 3cm in the middle front and middle back of the neckline. The “flatness” (or the fact that the curve nearly merge with the straight line) gives a perfect rounded neckline. At this point you’re probably asking yourself ‘but why divide by 16 “or” why mark precisely 1.5 cm on the bisecting line”. This proves your brain is normal and that you do not swallow all you can read. These figures are rather average measures working well for most of the patterns. So, trust the tailoring experience and your blogger and continue. Now you can use your protractor and measure an 18 ° angle for the back and 26 ° for the front with the shoulder line. Then, mark shoulder length you measured in step 1 on the new shoulder lines. Mark 3cm for the back and 2.3 cm for the front on the bisecting line between the underarm line and arm-to-arm height. You can now close the armhole with the curved ruler and enjoy your beautiful drawing. (Figure 7). The pattern corresponds to your measurements now (if you did not made too many mistakes). However it is not finished yet because it does not include any darts but this is another story that I will share with you soon. This method is relatively simple and well explained in the book “The Pattern Making, Volume 1” by Teresa Gilewska. Personally, I have applied it to most of my tops. From now on, you can show off in your neighborhood with your “patternmaker” talents . That way they will stop teasing you with cushion covers and kitchen aprons. 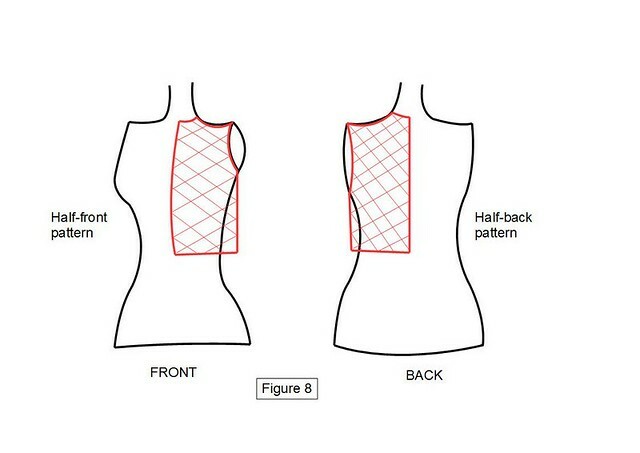 This entry was posted in Patterns and tagged basic shell, bodice pattern, flat-pattern drafting. 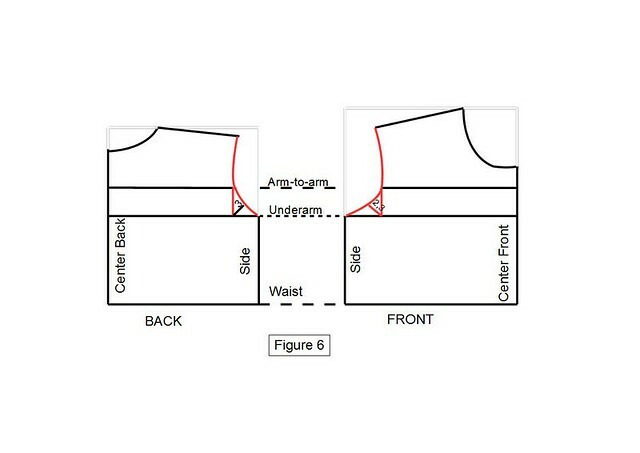 Could it be you mixed the expressions for Neckline width and neckline depth? 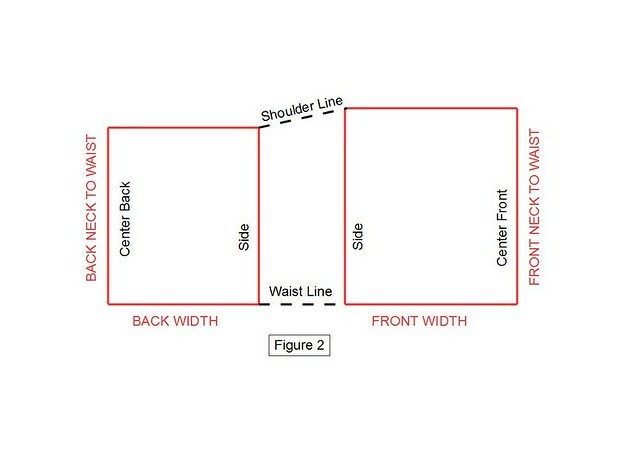 The width IMHO should be the one calculated as round neckline measurement / 6, resulting in the larger value of the two; for a round neck measurement of 33 cm resulting in 5.5 cm. Hello, maybe this page is better for my question. 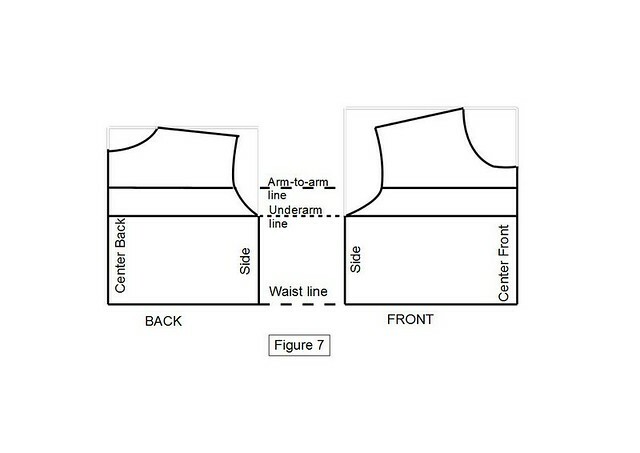 When I asked you, in the stretch bodice page’s comment section, about the front neck-to-waist longer than the back one, I was speaking about this tutorial about drafting a basic bodice shell. Your website is the Holy Grail. I never could figure out how to alter commercial patterns fit me – or make me look good. hello, ive just discovered your site yay! I have been sewing now off and on for years, I have 2 editions of the golden hands sewing pattern making hardback books, but so far your presentation of how to make the bodice pattern seems a lot more simple to understand than the 70’s one. I will look forward to coming back soon. Very good site and instructions given. I am back in a sewing mood but needs some touching up and I have found you. Looking at the bordice pattern, I noticed that the front is long that the back. Would this pose a problem when both shoulder at stitched together? Hello Beverly and thanks for reading my blog. There is normal that front is longer than back bodice as it needs to absorb fullness given by the breast. Hello! I am from India. I just discovered your site/ blog and was immediately interested. I have been wanting to make my own clothes for years but never had the courage because it seemed too complicated. Most video tutorials are too fast for new learners…Anyway, I’m thrilled to see your blog. Thank you! hi there. I’m sending this all the way from Cape Town, South Africa! – I was so grateful to find this post, I’m totally new to sewing so this has been a godsend!. You really made my with all these information. Thanx. Pls are u saying we can take underarm height measurement from side waist to underarm?. thank you,all the way from Nigerian .I will like to learn more from you.